If old habits are hard to break, perhaps Eagles fans would be better off skipping the 1st half of their games altogether. Through the first two weeks of the season, the Birds have scored a whopping six points combined in the 1st half, but have still managed to win both games while compiling, statistically, the #1 offense in the league. One wonders what would happen if they actually played the whole four quarters for a change. Things looked bleak for a while last week until Darren Sproles, who is undersized by NFL standards, performed his weekly “Popeye” act, turning into a 2nd half superhuman and propelling the Birds to victory. One can only assume that he must have downed a can of spinach on the sidelines with the sailor man’s theme song playing in the background. With the victory, the Birds also became the 1st team in NFL history to start the season 2-0 after being down by 14 points or more in the 2nd half of each game, a feat that speaks to their resiliency, their energy, and their ability to make adjustments on the fly. 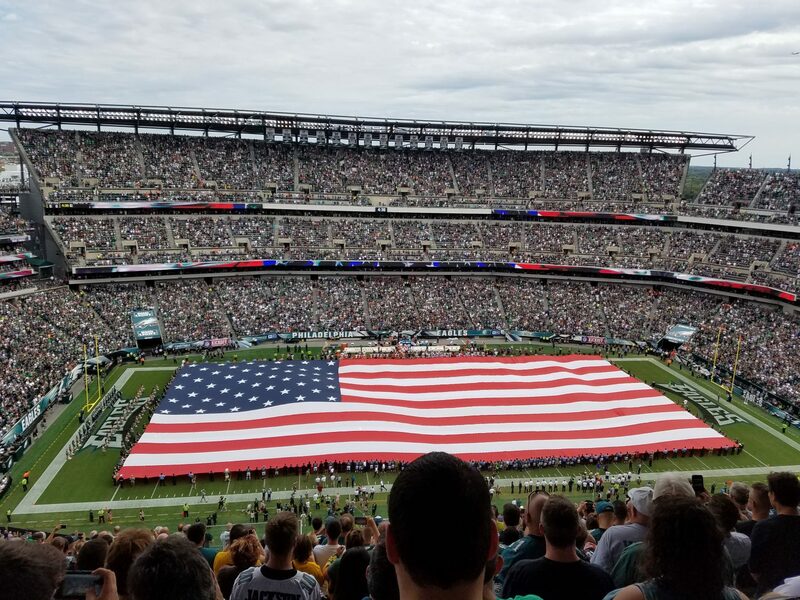 On the negative side, the Eagles inability to soar in the 1st half is causing sales of Mylanta to soar in the Delaware Valley, as the number of fans suffering from indigestion, heartburn, and acid reflux has increased considerably since Labor Day weekend. Winning in this fashion gives a team a certain amount of confidence that they are never out of it, but can also result in a belief that the end result will always be a “W”, a thought process that is bound to come back to haunt the Birds at some point. The Eagles were also lucky that against a good team and in a hostile atmosphere in Indianapolis, they had some calls go their way, most notably a non-call against them on a Malcolm Jenkins interception and a questionable horse collar call for pulling down LeSean McCoy. These “lucky breaks” have a tendency to even out under the guise of the football gods sitting high above on an NFL shaped cloud somewhere, and the Birds will undoubtedly lose a game down the road due to some questionable calls going against them. Let’s just hope that the bad karma doesn’t occur during a playoff game. The humor of those two back-to-back calls was that while they actually got the Colts fans in arms enough to boo for an extended period of time, they did not need to result in the “covering of the ears” of any young children in attendance at the game. One would probably not want to fathom what would have been shouted at the referees had those two calls gone against the home team here at the Linc. This week, the Birds face the Redskins, who trashed the Jaguars last week after starting quarterback Robert Griffin III (RG3) went down with what could possibly be a season ending ankle injury. Enter Kirk Cousins, who did nothing more than operate the offense as if he had been the starter for the last three years. Former Eagles wide receiver DeSean Jackson also managed to injure his shoulder last week and will be a game time decision as to whether he will play against his former team. The Birds won a game on the road last week that they probably should not have, and are coming off of a short week with perhaps a little bit of overconfidence. It also doesn’t help the Birds cause that Kirk Cousins will be at the helm instead of Robert Griffin III. While RG3 may be DeSean’s “bro”, Kirk may turn out to be the capital’s favorite “cousin”, and give the Redskins a much better chance to win in the long run. Sorry peeps, but I think the Eagles fall short this week, 31-27. This entry was posted in Eagles, football, NFL, Sports, Uncategorized and tagged Chip Kelly, Eagle, eagles, NFC East, NFL, philadelphia, Philadelphia Eagles, Philadelphia sports, Redskins, Washington Redskins. Bookmark the permalink.